The instructions provided describe how to identify the projected coordinate system for datasets that do not have coordinate system information in the metadata or a projection definition, using the project on-the-fly capability in ArcMap. Coordinate system (projection) information should be obtained from the data source or provider, but are not always available, such as with legacy data. The technique described below identifies the correct projected coordinate system. The term 'coordinate system' can refer to data in a Geographic Coordinate System (GCS) with coordinates in decimal degrees, or a Projected Coordinate System (PCS) with linear units in meters or feet. The term projection, or PRJ, is an older term that is also used, but it is not as precise. Instructions for this process in earlier versions of ArcGIS Desktop are provided in Knowledge Base article 000006217. Before beginning, read Projection Basics: What the GIS Professional Needs to Know. This article includes the parameters required for various coordinate systems, as well as useful information about working with coordinate systems in ArcMap. The steps in this article refer to projections for the United States, but these steps can be applied to identify a projected coordinate system for data in any country in the world. Start ArcMap with a new, empty map, and add the data with the unknown coordinate system to the map. This data must not be associated with a PRJ file or coordinate system definition. If a projection definition exists, it can be cleared using the Define Projection Tool in ArcToolbox > Data Management Tools > Projections and Transformations. Right-click the layer name in the Table of Contents, select Properties > Source tab, and examine the extent of the data. If the data is in the United States and shows an extent in which the coordinates to the left of the decimal are six, seven, or eight digits, the data is probably projected to either the State Plane or UTM coordinate systems. If the unknown data lies within the United States, add reference data (usstpln83.shp) from one of the directory paths below to ArcMap. On a 64-bit system, the path includes "Program Files (x86)". 10.x may refer to 10.1, 10.2, or 10.3, depending on the version of ArcGIS for Desktop installed. Click this link to view an image of usstpln83.shp. a. Click View > Data Frame Properties > Coordinate System tab. b. In the upper window on the tab, open Projected Coordinate Systems > State Plane. c. Use the Identify tool to identify the FIPS zone from usstpln83.shp in which the data should be located. d. Select and assign the coordinate system for the State Plane FIPS zone in which the data should be located. Select the relevant projection files for the area in which the data should be located from the folders in the directory. There are substantial differences in the position of data from the NAD 1927, NAD 1983 (US Feet), and NAD 1983 (Meters) folders, so test with these three options. Differences between NAD 1983 and HARN, CORS96, NSRS 2007, and 2011 are within three feet or so in most cases, and the objective at this time is to get the unknown data into the correct area of the proper state. After selecting a projection file, click Apply, and click OK.
Repeat assigning a State Plane projection file from the available folders until the usstpln83.shp file is appropriately placed and the data with the unknown coordinate system appears in the correct area in the proper state. Verify the correct place by zooming to the layer and using the Identify tool on the state where the data is drawn. 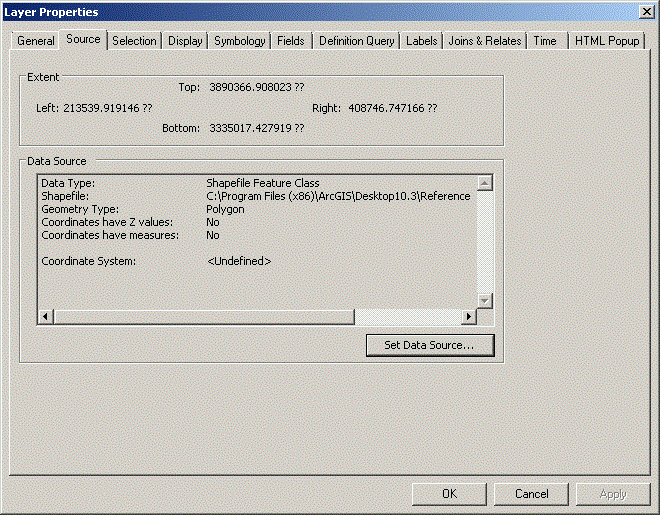 Add some test data to verify the exact position of the data. If one of the above options gets the "unknown" data in the correct area, but the data are still slightly off, test with different variations of the NAD 1983 datum. If the Geographic Coordinate System warning appears, apply the proper geographic transformation to the ArcMap data frame for each different NAD 1983 option. A list of supported geographic transformations is linked to Knowledge Base article 000004829. The International Foot (foot) is defined as exactly 0.3048 of a meter. While this difference is microscopic, if multiplied by a typical False Easting or False Northing value from the StatePlane Coordinate System, this difference may create an offset in the data of tens of feet. a. Open the UTM folder under Projected Coordinate Systems. b. Perform the same steps as described in Step 4, A-F. Select the correct UTM zone for the unknown data from the following datums - they are the most commonly used in the United States. Coordinates in UTM meters on the NAD 1983 datum and coordinates for the same point on the WGS 1984 datum in the continental United States are within a meter from each other. Data in the UTM coordinate system, on the NAD 1983 datum, is approximately 200 meters north of the same data on the NAD 1927 datum. There may be a slight shift either east or west between data on these two datums but an approximate 200-meter difference in the northing is diagnostic. The 200-meter difference is comparatively slight; therefore, it is essential that precise comparison data be used to determine whether the correct datum is NAD 1927 or NAD 1983 for data in the UTM projection. Make sure to apply the correct Geographic Transformation to the ArcMap data frame. If the above steps do not align the data, the data may be in a state-wide projection (see Projected Coordinate Systems > State Systems folder). 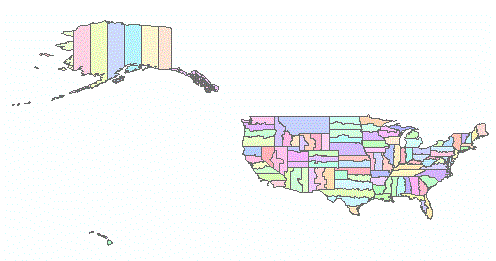 For data in Minnesota or Wisconsin, the data may be in a County Coordinate System. Additional information is provided in the book "Lining Up Data in ArcGIS: A Guide to Map Projections," published by Esri Press. For further information and ordering, click the link in the Related Links section below. For further assistance, contact Esri Support Services at 888-377-4575 or at support.esri.com. Esri Press "Lining Up Data in ArcGIS: A Guide to Map Projections"